Native advertising and “content discovery” platform Taboola has an ambitious plan to help people discover even more content, specifically “news.” The company, which is best known for enabling brands to scale native advertising across the open Web, has struck a deal to operate a news feed app on people’s phones. “It’s like Apple News,” boasts Adam Singolda, who founded Taboola 11 years ago and serves as its CEO. Unlike Apple News, Taboola’s news reader is native to Android phones, and its first deal enables it to distribute on devices manufactured by ZTE, the fourth largest phone brand in the U.S. behind Apple, Samsung and LG. Singolda says the news feed will be featured as a default application on new ZTE phones initially in Europe and Latin America, but eventually in North America, where ZTE currently has a 12% share of the smartphone marketplace. 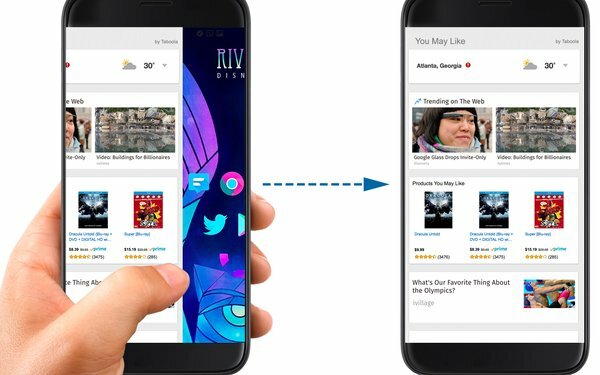 The Taboola newsfeed will appear on each phone’s “wake screen” -- the first screen users see when they unlock their phone -- as well as the “swipe right” screen for users who want to access Android news feeds. The main advantages for users will be a personalized news recommendation service, but Singolda concedes the company plans to eventually introduce “native” content promoting brands into the feeds, but only when it is authentic content that is relevant to a user. As an example, he cites a blog published by his “favorite drone company,” which he considers authentic news content, even though it is intended to promote its products and services. But for its initial phase, the content Taboola’s news feed will be promoting is that of pure-play editorial brands, the ones that publish actual news. The feed’s initial revenue model consists of news publishers paying Taboola to promote their stories to readers accessing their phone’s newsfeed. Singolda says Taboola will split these revenues with phone manfucaturers who distribute the feed. “If we get on tens of millions of devices or hundreds of millions, we will become as important as SEO [search engine optimization],” Singolda says of his dream to become a new gatekeeper helping publishers promote their news, though SEM (search engine marketing) likely is a better analogy, since publishers will have to pay to be discovered. Singolda says Taboola initially will work first with publishers that are already using Taboola’s native advertising platform, because the company already has a relationship with them and it’s an easy extension for them to work together on content discovery too. Why should users trust a company whose primary business is foisting native marketing content on web users? Because Taboola is “not a consumer-facing brand” and has no skin in what news it promotes in the feeds other than its being relevant to the user. In terms of a longer term play of introducing native content from consumer product marketers, Singolda says it would utilize the same principles of disclosure and consumer benefit Taboola uses in its open web platform.